That's today's big announcement: Wednesday, May 9, 2012, I completed hiking 2000 miles of Appalachian Trail as determined by the numbers published in the official Data Book for 2012. That's 1000 miles of trail, all hiked twice, once northbound, once southbound. It's a big milestone, and yet it's not even half of the 4368.4 miles I must hike this calendar year to achieve my goal: to be the first person to hike the entire AT both ways in one calendar year without ever spending an overnight on the trail. But beyond that numerical achievement, today's hike was one of the richest, most varied, most rewarding hiking days of the 119 day hikes that comprise that 2000 miles. I hiked over two big mountains - Pochuck and Wawayanda, and crossed the 3,950-foot-long Pochuck Swamp boardwalk - billed as the most volunteer-labor-intensive stretch of AT anywhere. The rain came through in several waves but did finally end at about 6AM. Meanwhile I was doing all the preparation chores. I moved to my parking spot on County 565 and was on the trail at 6:45AM – a full hour after sunrise. I wore a pair of shoes I had not worn in months in order to let my regular trail runners and the cheap but sturdy Spalding shoes dry some more. But those untested shoes ended up needing serious surgery to free up the toes on the left foot – these shoes were now clearly too small for my swollen feet. The surgery did the trick, however, and I made the hike west (trail south) over Pochuck Mountain, which presented three small summits, the middle of which has a nice vista that was totally fogged in on my way out but gave me a decent look at the trail route through the Wallkill NWR on the way back. The descent from that summit was steep and very rocky. Climbing the third peak, just before Pochuck Shelter I met an unlikely looking but trail-fit hiker named Lyle (no trail name), who hails from Michigan. I finally chatted with him at length after passing him twice today and twice both of the last two days – first passed him as he was ascending toward the High Point observation deck. He was the first person to pass through my hiker-interactive walk-through AT logo (see Monday’s entry). Lyle has done the entire trail from here to Springer and is out doing an impressively long section from Culvers Gap to Salisbury, CT. (close to Mass.). I explained my hiking methodology to him and promised we’d meet again. As I said, on this first passing today we only exchanged a quick pleasantry, then I hiked on down to my turn-around at Lake Wallkill Road and visited the shelter on return. Its log book was full so I left a new one. I was back at my starting point at 10:30 and there was Lyle resting on a log on the other side of the road – just shouted at him briefly and then got into my vehicle and changed into dry shoes and socks and reloaded food supplies and drank a Dr. Pepper. Back on the trail north, my destination was only as far as the next road crossing, County 517. Lyle had picked up and headed out before I hit the trail, so I passed him a mile or so later, and that’s when we finally had our in-depth conversation, as described above. This section of trail had a small meandering climb then a significant descent down to the edge of Pochuck Swamp at the highway. 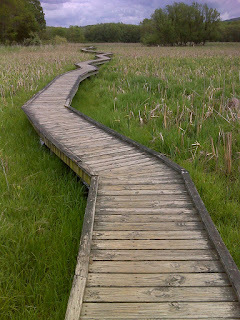 The famous, high-cost boardwalk over the swamp was next, but I would have to wait to walk it. I passed Lyle just after I had turned around and headed back. And that was the last time I saw him today. 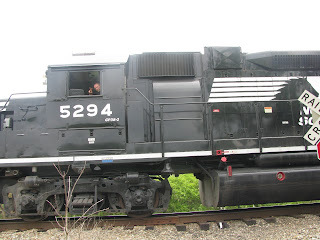 I got back to County 565 at noon and left that parking spot and scouted out the next two beyond the 517 crossing, which I had chosen not to use. I checked out Canal Road and found that the parking area there was more than a tenth of a mile from the AT – I walked that spur trail but wasn’t going to walk it again ‘officially’ so I moved on. I was desperately in need of gas and almost out of ice so I next drove down to the town of Vernon, only two miles out of my way, and found a good gas station at the intersection in the center of town, filled up with gas and ice. Then I headed back north and found the parking area on NJ 94. That’s a fairly busy road and the parking area was more than half full even on this midday weekday. 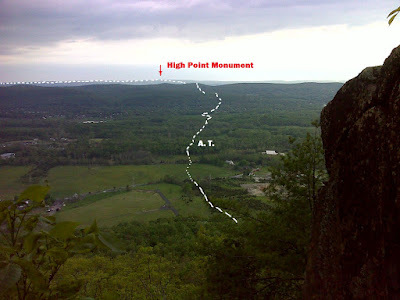 The popularity is understandable since from that lot you can go two miles south and walk the Pochuck Swamp boardwalk and you can go a mile north and get to some impressive rock outcrop vistas on top of Wawayanda Mtn. 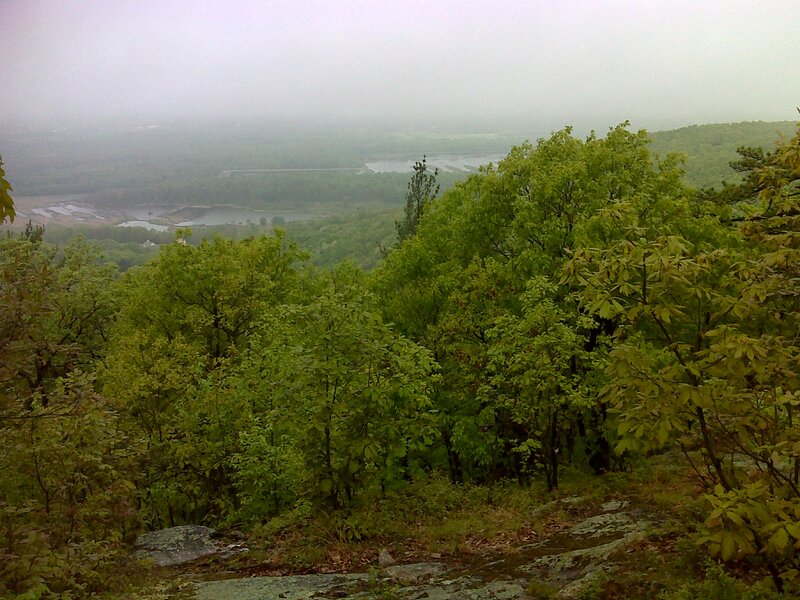 I had spent an hour off the trail doing those chores, so was hiking again at a bit after 1PM. Then I took my good-old time on the way to and across the boardwalk. 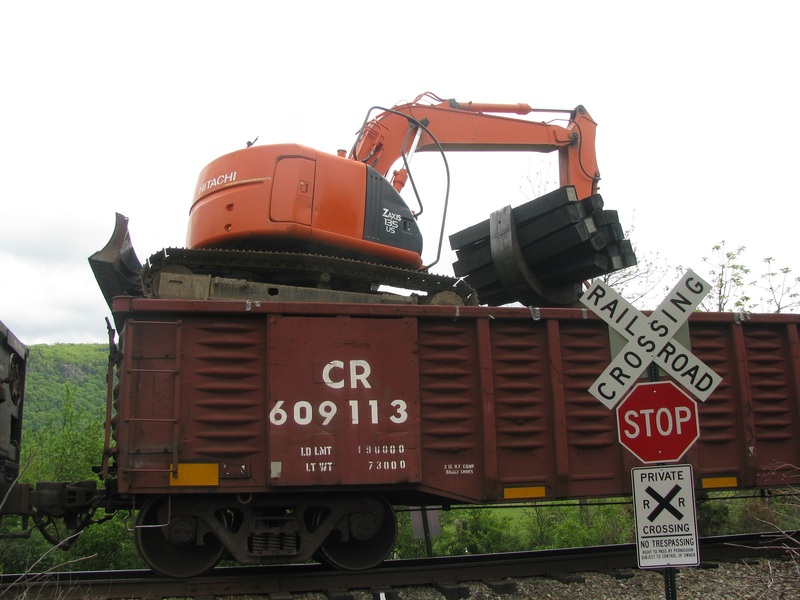 First I crossed a railroad track where a very slow moving train was unloading new railroad ties and dumping them in little piles all along the track. I talked with the engineer as he passed and took photos and just sat and watched as the entirely free-riding bulldozer-loader atop the open-top freight cars was precariously rolling back and forth (even between cars) picking up bundles of ties and swiveling and depositing them beside the track—fascinating. Then I headed on across a nice semi-open grassy area with lots of small walnut trees sprouting and finally on to the Pochunk boardwalk. There I met a lady right where I had stopped to photograph a snake and a turtle together on a log—they seemed to be staring each other down, and were oblivious to the two of us as we struck up a conversation. She’s a middle aged lady who had surgery for an abscess in her intestines and almost died. She had quit smoking and was, just today, out doing a walk to start to try to lose the weight she had gained after the successful surgery and the physical changes from quitting smoking. She knew nothing about the AT and started asking questions about it so I obliged with basic answers. We then headed opposite directions and I reached the highway 517 turn-around point and passed her on the way back, wishing her well and encouraging her to keep on walking every day. I was back at NJ 94 at 3:30, now with just barely enough time to complete the 20 miles required today to get to the 2000 mile mark – the completion of 2000 official data book trail miles (1000 one-way miles of trail). And to do it I had to make the 800 foot very rocky ascent up Wawayanda Mountain first. The good vistas from the rocks there are not on the AT, so I passed by without stopping to look for one – caught the closest one to the AT on the way back. It was pretty impressive, with the route of the AT visible nearby and the obelisk atop High Point clearly visible (to my eye, not so much in the 3 mega-pixel GPS photo I took) on the horizon. But I digress. 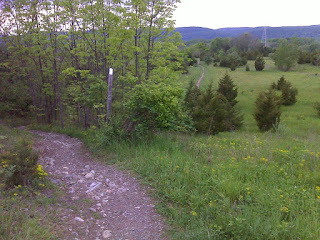 Atop Wawayanda Mountain is a trail register where a sign indicates the old AT leads 0.8 miles to a vista. Then the trail descends a few hundred feet to a very pretty stream running over big boulders and bedrock, then there’s a small climb and descent to Barrett Road where there’s a small parking area. On the north side of Barrett Road the AT takes an old woods road up to a minor summit and there leaves the old road and heads down into the woods. That minor summit was 0.3 miles beyond Barrett Road, and it’s where I turned around. At 0.2 miles I passed my precise 2000 mile point (once I had walked the leg twice and returned to NJ 94). So upon completion of today’s hike, I have hiked 2000.2 miles by the official AT Data Book numbers. Then the rocky descent to the base of the mountain featured two unpleasant issues. First was a quick shower that got heavy enough to make me pull out my poncho and put it on just in time for the rain to end – making me feel like a fool. Then a gentleman - late 30's I'd estimate - passed me and slowed down as we struck up a conversation. He was actually very interesting and had done a lot of hiking on the AT and elsewhere around the USA; but I was tired and downtrodden by my poncho episode and by the descent on the big rocks, and he is one of those people who seems to love to talk more than converse. At first the exchange was two-way, but slowly my end of the conversation dwindled and faded to nothing and his became a stream of babble to my weary mind. I finally spoke up and said we had to separate because I was worn out and getting a headache – not the most tactful maneuver, but the truth - which seems to be the only way I know how to treat people. I really had to break away from him or I would, indeed, have developed a headache. He wished me well and I said it was good talking with him (true for as long as I was talking *with* him), and then he sped up again and pulled out his cell phone and proceeded to exit stage center, phone to ear, yapping away, oblivious to natures evening voices along the very pretty field-walk at the apron of Wawayanda mountain. I inhaled deeply, lifted my eyes to the sky, spread my arms out to either side, and invited nature to return to me. And thus I resumed my Fellowship with the Wilderness. I was back at the AT parking lot at NJ 94 at 7:30PM and soon afterward it began to rain lightly. That continued intermittently right on through the night, so tomorrow looks like another day of wet shoes – in the morning at least. I changed and looked at maps a bit and had a beer and nothing else to eat or drink, then rolled up in my blanket on my mattress and went to bed at 8PM. I slept well until midnight, though once or twice I woke up with some pain in my left ankle. Today during my hike I had developed a pain in my lower left shin quite early in the day – something I had not had before. Tonight that spot was sensitive, but it became clear that it was actually caused by, or rooted in, the pain from a turned ankle. So now I realized that I had indeed aggravated my left ankle sprain that first developed near Damascus VA. But this time I know how it happened – it happened Tuesday evening, off the trail! I was trying to flatten a soda can by stomping on a shoe set over the can (in other words I wasn’t wearing the shoe, just using it as a platform/cushion to flatten the can with my stocking feet), and stupidly I was using lots of force on that uneven shoe surface. My foot came down crooked and the pain immediately told me I had done damage. So now I have that classic story to tell – hiked 2000 miles on the Appalachian Trail in 119 days and then turned my ankle trying to crush a soda can. Below is a map of where I hiked today. The straight line through the middle shows where I turned off my GPS and moved from one road-side parking lat to another. It's not part of the hike, but I don't know how to delete it. The title provides a link to many more photos.